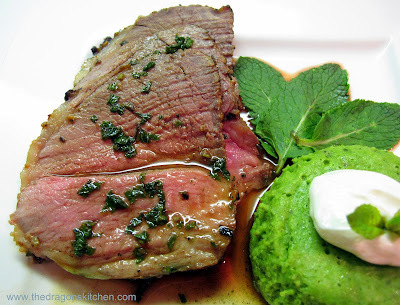 Lamb is Spring to me, so what better way to welcome it than with this amazing dish. Lamb has always been a part of my heritage and I remember many wonderful family meals with a whole lamb roasted over hot coals. Sigh...nostalgia. This dish is another second entree option on Titanic's 1st class dinner menu. The marinade is simple, yet classic; garlic, rosemary and mustard. I marinated my lamb just over 24 hours and it was perfect. As with the Roast Sirloin of Beef Forestiere, I had a little trouble with the consistency of the sauce but the flavours were delicious. Next time I make this dish, I'll add a pat of butter to the sauce at the end to give it more sheen and added thickness. 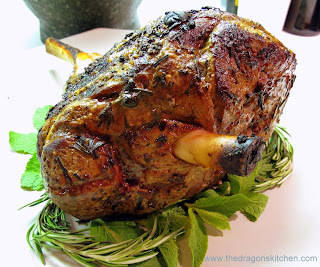 This lamb will be featured on my dinner party's final menu. Enjoy! 1. Trim lamb of gristle and excess fat. 2. Stir together garlic, 2 tablespoons of the oil, rosemary, mustard and pepper; rub surface of meat. Marinate at room temperature for 1 hour or in refrigerator for up to 48 hours. 3. In large heavy skillet, heat remaining oil over high heat; add leg and sear, turning often, for about 5 minute or until well browned on every side. Place leg in roasting pan. Pour wine and salt into skillet and bring to boil, stirring to scrape up any brown bits; pour over meat. 4. 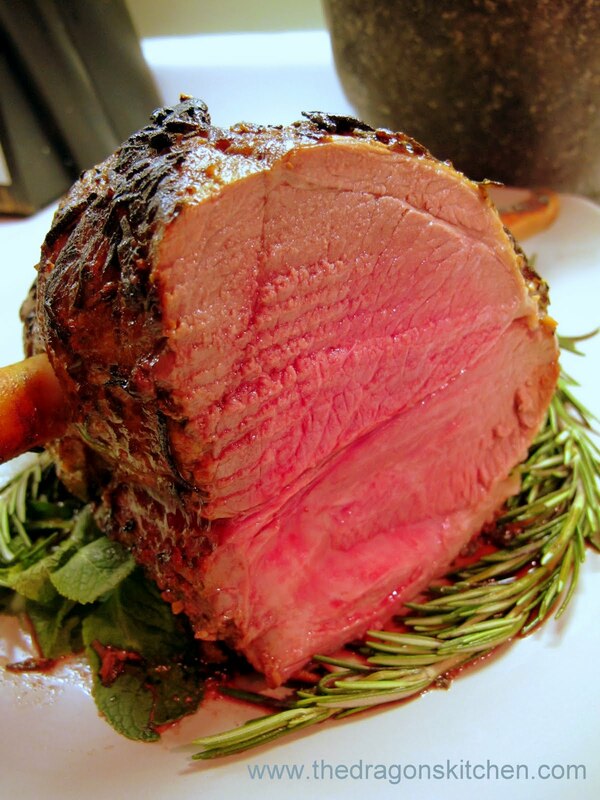 Cook lamb in 450F oven for 15 minutes; reduce heat to 350F and continue to roast for 25 minutes for a rare roast (125F on instant-read meat thermometer) or for 35 minutes for medium-rare (140F on instant-read meat thermometer). Remove roast from pan and tent with foil; let rest for 15 minutes. 5. Mint Sauce: Meanwhile, place roasting pan over medium heat. Stir in shallot and cook, stirring often, for 5 minutes or until softened. Stir in wine; bring to boil and cook, stirring, for 1 minute or until reduced to a glaze. 6. Stir in stock, vinegar, and sugar. Continue to boil rapidly for 2 minutes or until sauce is slightly thickened; pour through fine-meshed sieve. Stir in mint. 7. Serve mint sauce alongside roast. Garnish with fresh mint sprigs. sounds incredible paula. this titanic meal is a challenge, but worth every tantalizing morsel. Hi, Dragon, lol. This is also my nickname in Brazil, but I have no blog revenue. Yours is wonderful. I found it looking estrava revenues last dinner on the Titanic. I loved your blog and also love to cook! Hugs Blumenau, Santa Catarina, Brazil. By the ways i love your blog!